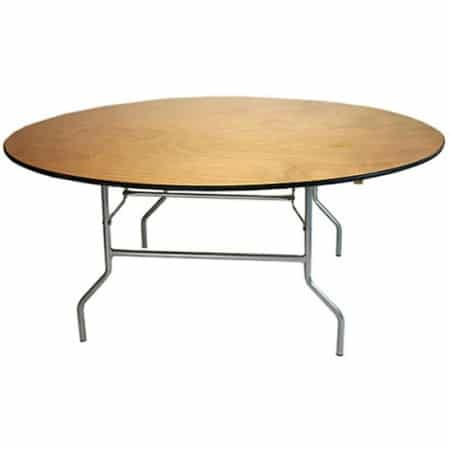 Table Top: 60 inches round, Standing Height: 30". These tables will seat 8-10. 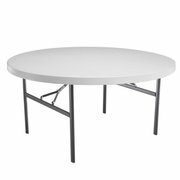 Tables may be plastic or wood depending on inventory levels. For delivery customers, price for tables and chairs does not include setup. Tables and chairs will be delivered to a reasonable distance from our delivery vehicle. Please advise if stairs are involved as there will be an additional fee. At time of pickup, items are expected to be as they were left. If you would prefer setup and takedown, please add $0.50/chair and $1.00/table. If delivered with other items, tables and chairs are delivered and picked up at the same time as all of the other items you have reserved. If you need other arrangements, please let us know upon reserving. For pickup/return customers, these ABSOLUTELY WILL REQUIRE a cargo van, pickup truck or box truck. They will NOT fit in an SUV, minivan or car.